Homepage intro: A deeper vision of the meaning and significance of culture. Does the future of humanity lie in a culture founded solely upon reason and science? Is the progress of human life the effort of a mind, a continuous collective mind constituted by an ever changing sum of transient individuals, that has emerged from the darkness of the inconscient material universe and is stumbling about in it in search of some clear light and some sure support amid its difficulties and problems? And does civilisation consist in man’s endeavour to find that light and support in a rationalized knowledge and a rationalised way of life? An ordered knowledge of the powers, forces, possibilities of physical Nature and of the psychology of man as a mental and physical being is then the only true science. An ordered use of that knowledge for a progressive social efficiency and well-being, which will make his brief existence more efficient, more tolerable, more comfortable, happier, better appointed, more luxuriously enriched with the pleasures of the mind, life and body, is the only true art of life. All our philosophy, all our religion, —supposing religion has not been outgrown and rejected, —all our science, thought, art, social structure, law and institution must found itself upon this idea of existence and must serve this one aim and endeavour. This is the formula, which European civilisation has accepted and is still labouring to bring into some kind of realization. It is the formula of an intelligently mechanised civilisation supporting a rational and utilitarian culture. Or is not the truth of our being rather that of a Soul embodied in Nature which is seeking to know itself, to find itself, to enlarge its consciousness, to arrive at a greater way of existence, to progress in the spirit and grow into the full light of self knowledge and some divine inner perfection? Are not religion, philosophy, science, thought, art, society, all life even, means only of this growth, instruments of the spirit to be used for its service and with this spiritual aim as their dominant or at least their ultimate preoccupation? That is the idea of life and being, —the knowledge of it, as she claims, —for which India stood till yesterday and still strives to stand with all that is most persistent and powerful in her nature. It is the formula of a spiritualised civilisation striving through the perfection, but also through an exceeding of mind, life and body towards a high soul-culture. Whether the future hope of the race lies in a rational and an intelligently mechanised or in a spiritual, intuitive and religious civilisation and culture, —that, then, is the important issue. Wߋuld love tto constantly gеt updated outstanding site! a contributіon & aid other users lіқe its helped me. 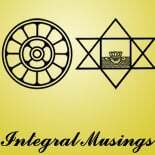 This entry was posted on August 13, 2016 by integralmusings in Society & Culture.